Consider yourself invited to the Quadra Island Studio Tour, the weekend of June 5 and 6, 2010. With 30 artists participating this year, we have nearly everything: sculptors, painters, potters and ceramic artists, fabric artists, glass blowers and fused glass artists, metal artists, guitar makers, photographers, a healing artist, and a world-class bicycle builder and racer. Tickets, available at various locations, are $5 (kids free). Quadra Island is a 10-minute ferry ride from Campbell River, 150 km north of Nanaimo on the Island Highway. There are many options for accommodation: a hotel, several resorts, many B&Bs, and camping at Rebecca Spit Provincial Park. In addition to restaurants at the hotel and resorts, there are several others. Many of these venues will offer special rates for the tour. There is even a B&B a 5 minute walk from my studio. At the time of last year’s tour, all my sculptures were in Vancouver and I didn’t participate. Instead, I bought a ticket and made the rounds as a “civilian”. I highly recommend the experience. In addition to seeing every corner of this beautiful island, I was treated to some very fine art and some fascinating and productive artists. It takes at least one full day to see everything; better would be to spread your visits over the whole weekend. One thing I greatly appreciated about the tour was to learn how other artists organize their work and their workspace. Of course, different kinds of artists must do this in different ways, so it was quite revealing to visit so many of them in such a short period. For example, when I entered Rich Pielou’s guitar-making studio, he was conducting a lecture-demonstration for a couple of carloads of visitors. As a lifelong teacher, I was impressed that his audience was so fully engaged that they didn’t even notice me come in. I learned more about resonance in a few minutes of listening to Rich talk about making guitars than I had in a lifetime of reading. Similarly, I learned a great deal about lighting and pigments from Perrin Sparks, about sharpening woodcarving tools from Mike Ballatti, and about organizing and running a thriving pottery studio from Gordon and Martha James. One of the more fascinating stops was at William Van Orden’s. Using real marine organisms as his models, he casts and colours precisely accurate, museum-quality replicas of fish, sea stars, and other creatures from these waters. And it was standing room only at Cherie Hemmingsen’s glass-blowing studio; there must have been 20 people there watching Cherie and her colleagues demonstrate their craft. If I had the luxury of going on this year’s tour, I would not want to miss Kevin Johnson’s studio. His pencil drawings of wildlife, landscapes, and people are exquisite! It is difficult for me to imagine having eyes that see that well or hands that can execute such subtle detail, and I would surely want to see some of Kevin’s works in progress and ask him questions about the work. In a place like Quadra Island, not only are many of the studios situated in spectacular settings, but moving between them would be impossible without passing through some of the most beautiful scenery anywhere. Here are a few examples. Just south of Quathiaski Cove, Gail Rankin’s painting studio commands a southwest view of the busy shipping lanes between Quadra Island and Campbell River, framed by the high peaks of Strathcona Park in the background. Chris Rose’s studio, carving school and B&B look eastward, toward Cortes Island, Powell River, and the high mountains of the mainland. Right in the middle of the island, Wilma Richardson’s painting studio, itself an architectural delight, looks down into a pristine forested canyon. My own studio is a beauty too, in at least to my own eye. Just getting here is a treat. You drive past the first two of a chain of 5 interconnected lakes in Main Lake Provincial Park, for example. It would not be accurate to say my studio looks out over anything at all, for it is in a concave place and it looks into nature in every direction. I have written in this space about several of the wonders this hollow offers: huckleberries, birds’ nests, colourful trails. The west wall of my outside carving studio is a wet mossy cliff that literally drips with verdant growth. Here are two examples from last week. Inside the studio, stone and bronze sculptures and works in progress will be on display, as will archival-quality photographs of my works, displays of stonecarving tools and techniques, examples of 3D computer modeling of sculptural forms, and a laser light show demonstrating a technique I use to evaluate the quality of surfaces as I carve them. I have illustrated 8 different articles in this space with laser images, and several videos demonstrate the technique on my website. Outside the studio, tons of uncarved stone stimulate the imagination. You will see similar offerings at each of the 30 studios on the tour. 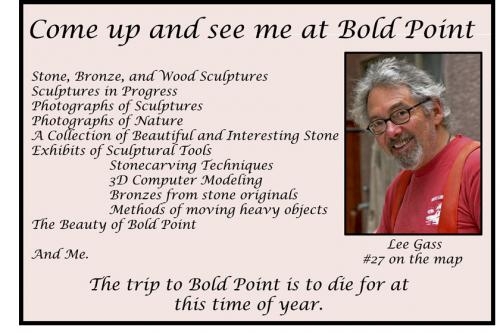 Please join us on Quadra Island for the 2010 Studio Tour. 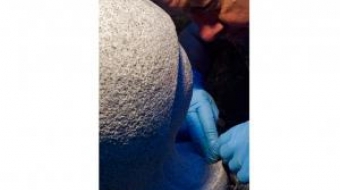 Sculptor Michael Binkley looks back at three decades of professional stone sculpting, reflecting on how he was able to succeed in the business of making and selling art. 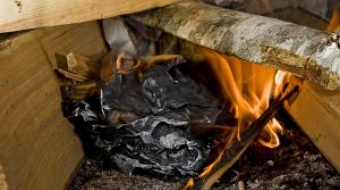 Sculptor Lee Gass reflects on Jack London's short story To Build a Fire and some childhood mistakes in the mountains in relation to his daily ritual of building a fire in his stove on Quadra Island.